Tasmania is the place I have spent the most time – primarily because I spent the first 21 years of my life there! It’s also somewhere I keep coming back to, especially now all my family lives there again. It’s a place known for its natural beauty. I grew up surrounded by trees and bush, living on a mountain where I actually saw snow occasionally (rare in Australia). It’s very different to living in inner city Melbourne, which I now call home. And while I wouldn’t swap the opportunities and action of a big city, I do love going back to the trees and the bush and the natural beauty which I rarely see in my day to day life. 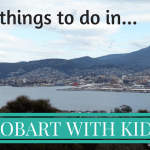 I get many questions about what to in Tasmania with kids (and without) particular around what to see in Tasmania in 7 days. Although Tasmania can seem small compared to the rest of Australia, you still can’t see it all in 7 or 14 days. To help you plan your trip, I have written this list of my top 25 places to visit in Tasmania – the ultimate bucket list! The Museum of Old and New Art (MONA) is the biggest privately owned museum in Australia and located in a suburb of Hobart. It is truly amazing. It is by far my favourite art museum in the world and I recommend it to everyone – even people who don’t generally enjoy art museums like me or people looking for activities in Tasmania for kids. This museum is interactive, entertaining and completely different to anywhere else I have been. It is also confronting, controversial and riveting – I never knew what was going to come next. There is a great deal of variety in the exhibits and the use of light, sound, movement and the involvement of all your senses means no one is going to get bored – even young kids. This is definitely top of my list of must see places in Tasmania. You can read more in my full review in my guide to Hobart. 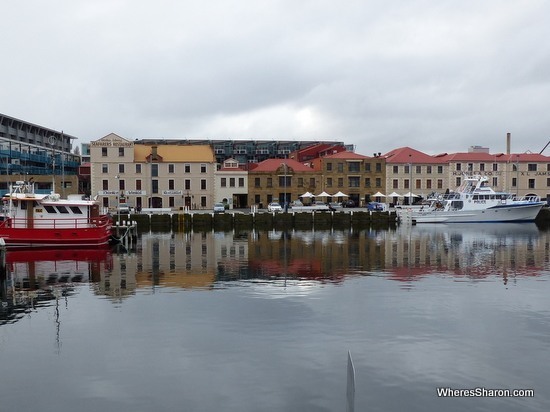 The beautiful Hobart waterfront – we stayed right here. Read more about it in our Sullivans Cove Apartments review. Hobart’s waterfront is a picturesque area of boats, old warehouses, buildings, restaurants and floating fish shops! 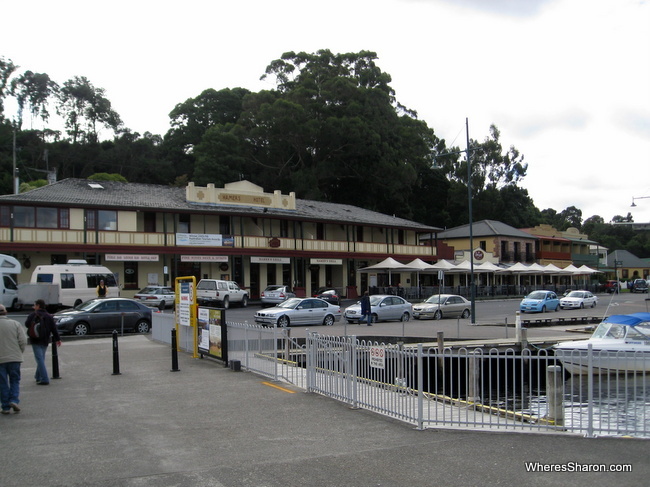 It’s one of the great places to go in Tasmania for a wander and to eat some fabulous seafood. 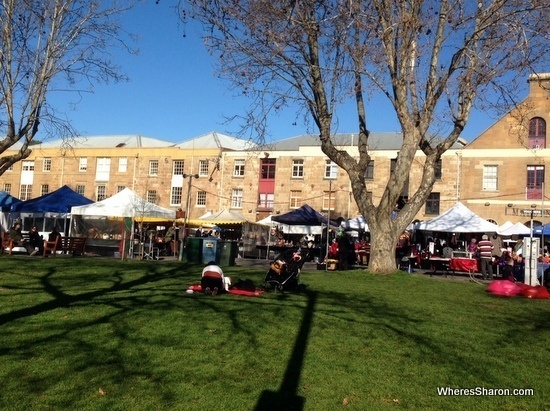 Hobart’s Salamanca Market is the most popular place to visit in Tasmania with 25,000 to 40,000 people visiting each weekend! It takes place on Saturday mornings until 3pm when 300+ stalls line Salamanca Place at Hobart’s waterfront. This is a great place to pick up a souvenir, try some local food and soak up the atmosphere. There are many surrounding parks and gardens which make a great spot for a picnic after picking some food at the market or for the kids to run around. Even when the market is not taking place, this is a nice area to visit with some great pubs, restaurants, cafes and shops. I used to spend a lot of time around here when I lived in Hobart. A trip to Southern Tasmania would not be complete without heading to one of the best places to visit in Tasmania – the summit of Mt Wellington – or simply “the mountain” as locals call it. 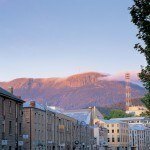 The mountain towers over Hobart and it’s impossible to miss it – it’s a beautiful backdrop to Australia’s southern most city. 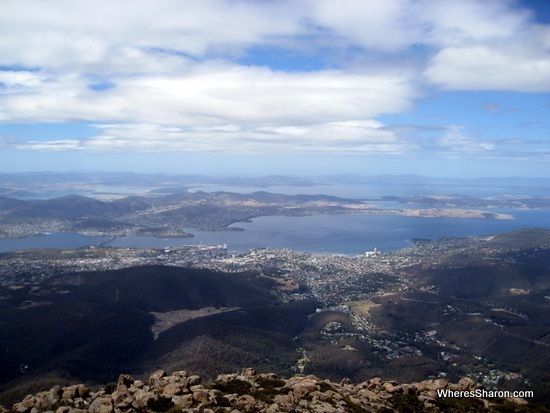 At 1271 metres tall, it offers fabulous views over Hobart and Southern Tasmania. Although I would recommend going on a clear day, it can also be fun to go on a cloudy day when it can feel like you are above the clouds! In the colder months, the mountain is often snow capped which means an opportunity to play in the snow. You can drive all the way to the summit although in Winter the road can be shut or you may require chains. So check before you go here. 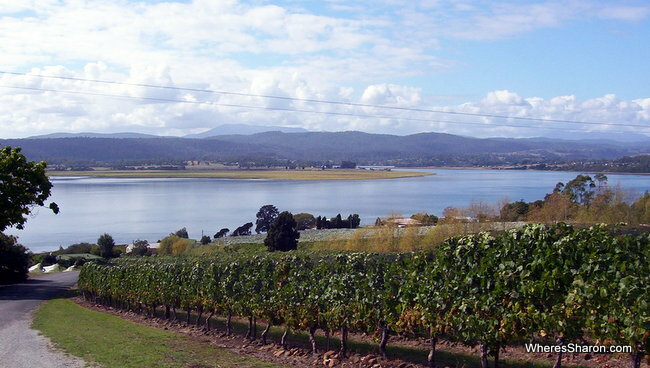 The Huon Valley is home to some great places to see in Tasmania. 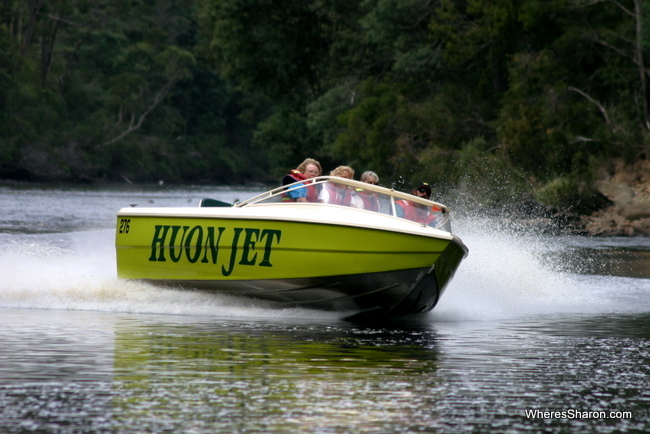 There is some beautiful scenery and one of the fun ways to see it is in the photo above – a thrilling jet boat ride on the Huon River. For a more sedate way to see more of the Huon River, you can also hire pedal boats in Huonville. Another of our favourite activities in this region is the Tahune Air Walk – walk above the tree tops including a 50 metre high hanging section at the end over the river. You can also go on many forest walks here and try cable hang gliding. More information on the Tahune Air Walk including latest prices is here. For one of the different things to see and do in Tasmania, head to Hastings Caves and Thermal Springs. It consist of two main attractions – the caves themselves and some nearby thermal springs where you can take a dip in a swimming pool. Hastings Caves are dolomite caves formed millions of years ago. They make quite a sight and are home to stalactites, columns, shawls, straws and stalagmites. You visit on a guided tour and they are quite spacious – I did not find it at all scary. The swimming pool has been filled with lovely 28 degree thermal spring water. The Thermal Springs are surrounded by forest with all essential facilities – BBQs, toilets, change rooms etc and is a great place for a picnic. I absolutely loved coming here when I was a kid and it is one of the most fun things to do in Tasmania. 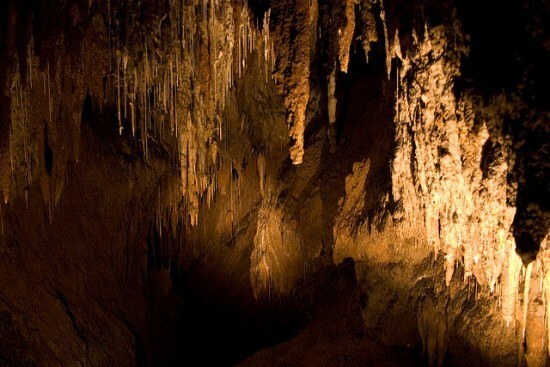 Hastings Caves and Thermal Springs are a 90 minute drive south of Hobart through the Huon Valley. Find more details here. A trip to Tasmania would not be complete without seeing one of these small (and endangered) creatures. 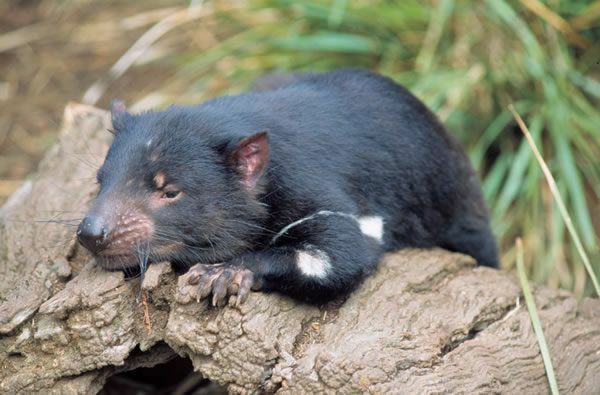 The best places to go in Tasmania to see Tasmanian Devils are one of the many wildlife parks. My best place to see Tasmanian devils is the Bonorong Wildlife Sanctuary on the edge of Hobart, but there is also Tasmanian Devil Unzoo on the way to Port Arthur, Zoodoo near Richmond and the Tasmania Zoo just outside of Launceston, as well as other places. 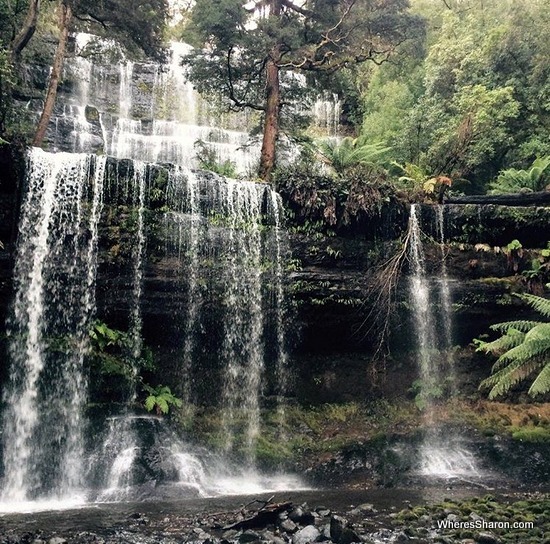 Tasmania’s first national park is full of great scenery, a good range of walks and plenty of wildlife. It also has great facilities – I have camped here several times. Russell Falls is the star attraction and beautiful. It’s an easy walk to get here which is even wheelchair accessible. The walk takes you through a fern forest with some of Tasmania’s tallest trees. In Winter, there’s skiing and snowboarding. 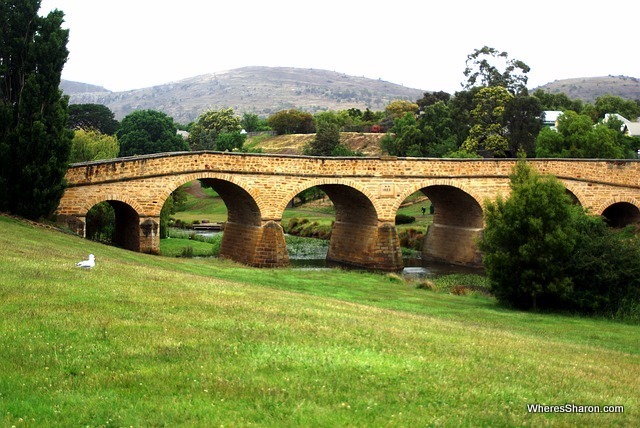 The historic town of Richmond is located just outside of Hobart – only a 25 minute drive from the CBD. It’s always been one of my best places in Tasmania – it’s a cute town full of historic buildings with an interesting past and some interesting attractions. Richmond’s convict past is best described at the old Richmond Gaol – the oldest in Australia – and you can also walk over Australia’s oldest bridge (pictured above). 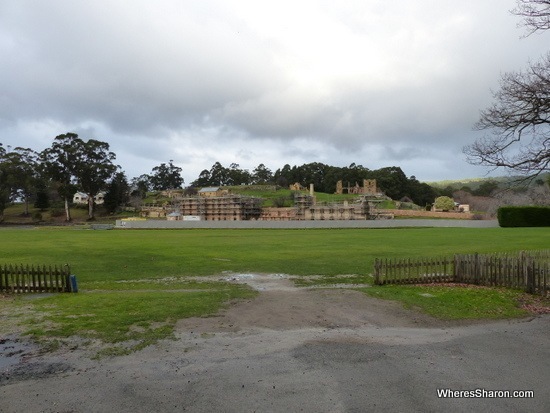 Other attractions include the Hobart Town Historical Model Village and the Richmond Maze (currently under renovation but hopefully open when you visit – I have always loved this place). The best part, however, is walking around and seeing all the old Georgian buildings. Many are home to shops, cafes, restaurants and galleries. I particularly like the bakeries and sweet shop! There are also some great wineries in the area. The best place in Tasmania to learn about Australia’s convict past is at the Port Arthur Historic Site. 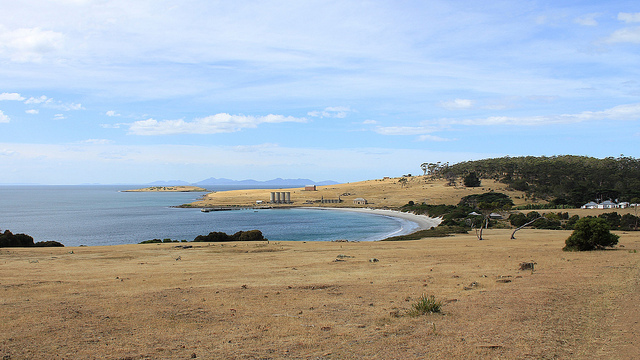 This big site, about 90 minutes drive from Hobart, was open in 1830 as a penal settlement. In 1833, it became a punishment station for repeat offenders – so basically the worst convicts in the country. The prison system here included many buildings which you can visit today. This includes the British Empire’s first juvenile prison at Point Puer and new “treatment” techniques such as the silent prison and asylum. There’s also other buildings that show how the military, free men and their families lived in Port Arthur. It’s a big site and entry includes both a boat tour and a walking tour. There’s also many other options. There’s many more attractions at this site as well as a ghost tour at night! You can find more information as well as our tips for visiting the site in our full review. Doo Town must be the whackiest place to visit in Tasmania. This small town is an amusing stop on the way to Port Arthur. 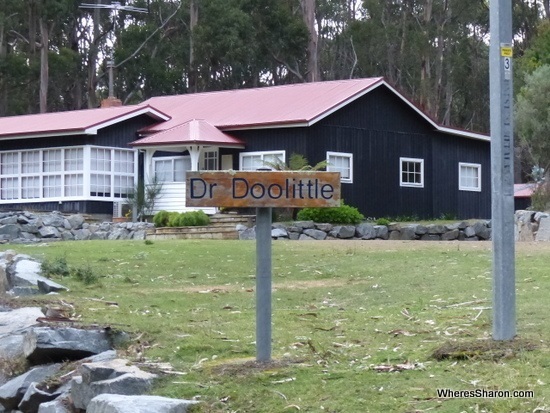 Basically every house has a name out the front that include the word “Doo”. You can see Doo Drop Inn, Make Doo, Wee-Doo, Doo-N-Time and the provocatively named, Doo Me, as well as many others. Read more about this town in our article here. 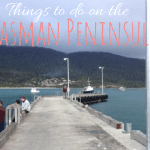 You can also read more in our list of the best things to do on the Tasman Peninsula. It is one of many worthwhile free things to do in Tasmania. Maria Island National Park offers wildlife, dramatic scenery and convict ruins. The 14 convict buildings and ruins from the convict probation era at Darlington are World Heritage listed. Entry to the island is via ferry and once on the island, there are some great walking and cycling tracks. In addition to the ruins, there are some beautiful beaches and cliffs to visit as well as some peaks to climb with views over the island and up to Freycinet National Park. There is great bird watching and you need to be on the look out for kangaroos, wallabies, wombats, tasmanian devils and other wildlife. It’s possible to camp on the island and there is also bunk room accommodation. You can also just day trip to the island (which is what I did). Maria Island is located off the East Coast of Tasmania and is easy to visit via ferry. Find more information here. Wineglass Bay is one of the top places to visit in Tasmania if you love gorgeous scenery and beaches. It often makes the list of most beautiful beaches in the world. 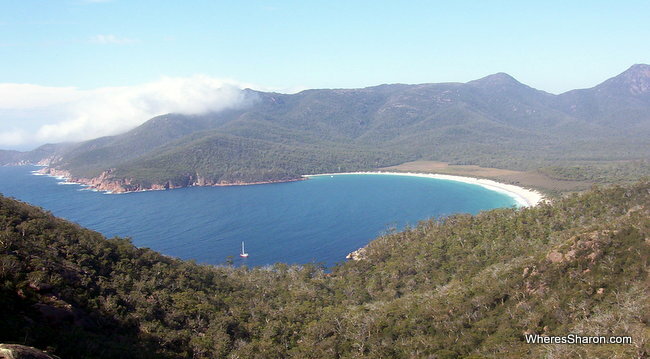 Wineglass Bay is located in Freycinet National Park. The best and worst parts about this is that there is no road access – there is a steep up and down walk to get to this beautiful bay with views like you see above on the way. The walk takes about an hour each way but it is steep in parts so can be quite a work out. The reward is far less people than what there would be otherwise. It’s also possible to visit Wineglass Bay by sea kayak. You can camp here and there’s also many walks further into Freycinet National Park. Freycinet National Park is on Tasmania’s East coast and can be accessed via Coles Bay. More information here. One of the best places to see in Tasmania is the incredibly beautiful Bay of Fires. This coastal area is known for it’s fine white sand, blue sea and orange tinged rocks. The name, Bay of Fires, refers to Aboriginal coastal fires spotted by Captain Tobias Furneaux when he sailed past in 1773. Binalong Bay is located at the southern end of Bay of Fires and is the entry point into this area. There are many outdoor attractions here, including hiking, game fishing, surfing, bird watching and enjoying the beaches and scenery. There is beach side camping as well as elevated sites among the trees with amazing views. You can find more information here. Binalong Bay is located on the East coast of Tasmania about 2.5 hours from Launceston. 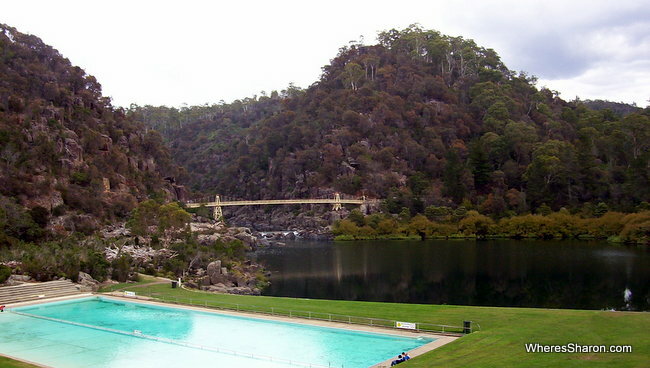 Cataract Gorge is a beautiful area in Launceston. There’s walking trails, a great park area, the world’s longest single span chair lift, a pool area, peacocks and a kiosk and a restaurant. It’s a good choice of Tasmania attractions for families. You can read about other things to do in Launceston and the Tamar Valley in our dedicated guide. Just outside of Launceston is the Swiss themed town of Grindelwald. It’s very cute and there are some lovely little shops, a golf course, mini golf and other activities. 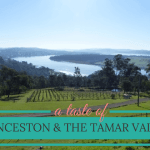 It’s also home to the Aspect Tamar Valley Resort which is a great place to base yourself to explore this part of the state. You can read our full article about Grindelwald here. While visiting Launceston and the Tamar Valley region, you’d be crazy not to visit some wineries. It’s easy to go on a self guided tour and there’s plenty of delicious vintages to try. This site has some great information to help you plan your own tasting adventure including some suggested routes. 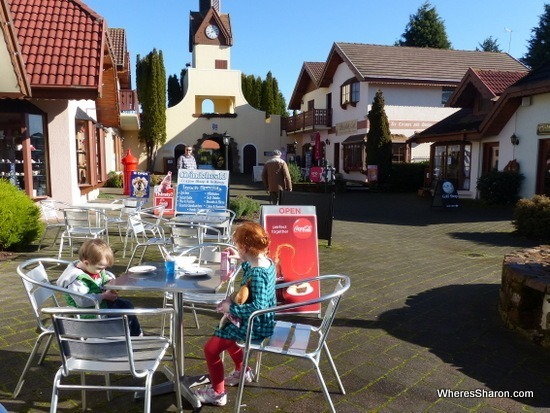 The Christmas Hills Raspberry Farm is a fabulous cafe and outdoor area. It makes for a particularly great breakfast stop if you have just got off the boat from Melbourne, but it is a nice place to stop at any time of day. They serve the best waffles ever which come complete with raspberry ice cream, cream and, of course, raspberries. They are very child friendly and gave our kids colouring in pencils and paper. Outside, there is a small lake with walking tracks and a toddler playground. 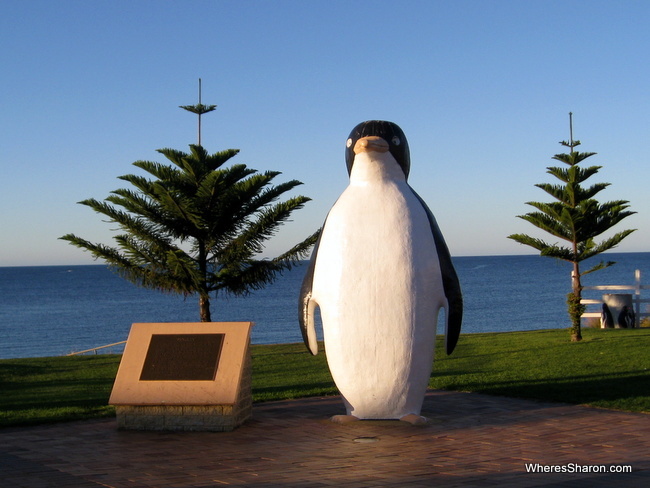 Australia loves its “big” attractions and in the seaside town of Penguin on Tasmania’s NW coast you will find one of them – the Big Penguin. In the North West of the state, you can find the famous Nut. The Nut is a sheer sided bluff which is all that remains of an ancient volcanic plug. You can’t visit The Nut without going up to the summit. For the fit and healthy, you might want to try walking up. For the rest of us, there is a chair lift. 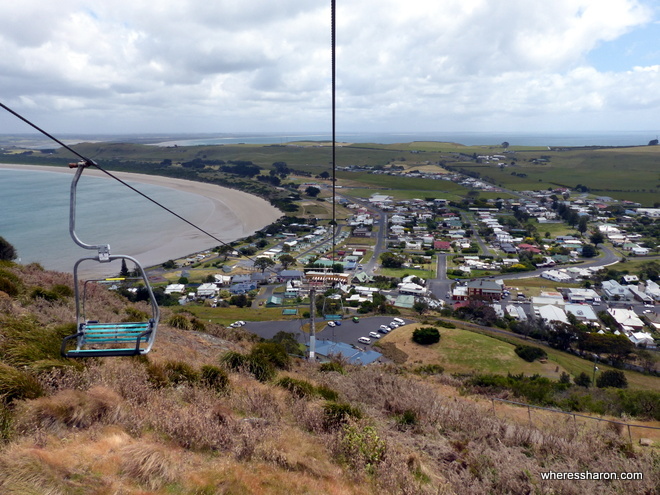 At the top are great views over Bass Strait, the surrounding beaches and the town of Stanley. Tarkine: The Dismal Swamp and the very cool slide. This forest in Tasmania’s far North West has a great attraction – the Tarkine Forest Adventure at the Dismal Swamp. 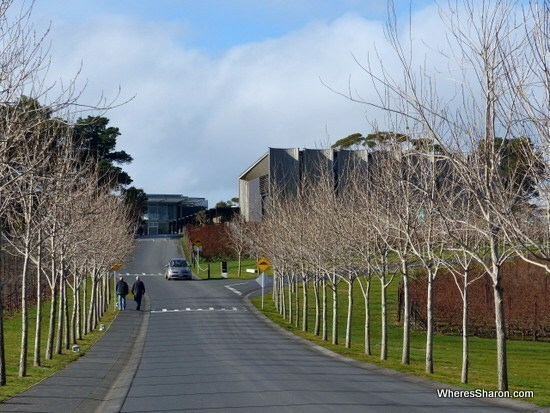 This best place to visit in Tasmania is home to not only a beautiful wilderness area but it’s easy to get up close and personal thanks to a visitor centre and walkway above the trees. 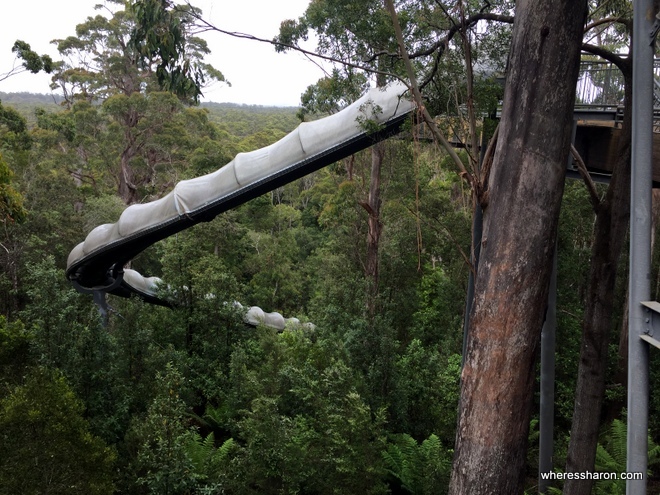 After viewing the forest from above, you can then take a 110 metre slide or take stairs descending into Dismal Swamp. Dismal Swamp is a 40 metre deep sinkhole with a unique forest habitat, believed to be the only natural blackwood forest sinkhole in the world. Here, there are wooden walkways with interpretive signs. You can find out more information here – kids need to be 8 or older to use the slide. Read more in my full guide to North West Tasmania. 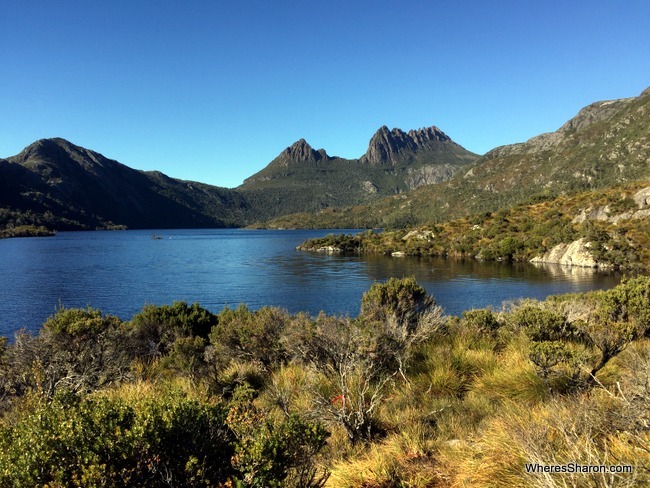 The Cradle Mountain – Lake St Clair National Park is one of the best places in Tasmania to visit. It is certainly one of the most famous among outdoor enthusiasts. It’s home to the Overland Track and the beautiful Cradle Mountain. It is also part of the Tasmanian Wilderness World Heritage Area. The scenery is superb and you don’t have to be a serious hiker to enjoy it. Cradle Mountain is quite accessible as you can drive to the pretty Dove Lake (pictured above). From here you can enjoy views of Cradle Mountain or choose to walk around the lake or spend a day walking to the summit of Cradle Mountain. You can also start the Overland Track from here. Cradle Mountain is a two and a quarter hour drive from Launceston. More information here. Strahan and the West Coast is one of the must visit places in Tasmania. I don’t think I have been somewhere where I felt so isolated from the rest of the world after a drive in through forests. There are some fabulous places to visit from Strahan – you can read them in #24 and 25 below. Strahan is also worth visiting in itself. It’s a pretty little town with a nice (but small) waterfront area. You can read more about the 3 day weekend we spent visiting Tasmania’s West Coast Wilderness here. 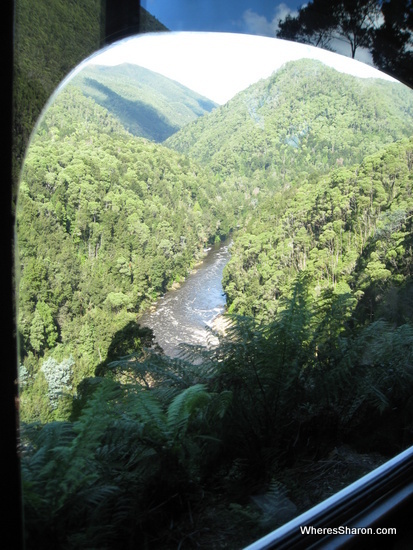 The West Coast Wilderness Railway runs between Strahan and Queenstown and is an excellent way to see more of this part of Tasmania. The train itself is an experience – an old steam train with refurbished carriers. It runs through temperate rainforests that can only be accessed from this train. Find more information on their site and in our full article. We treated ourselves to the Wilderness carriage which was amazing. 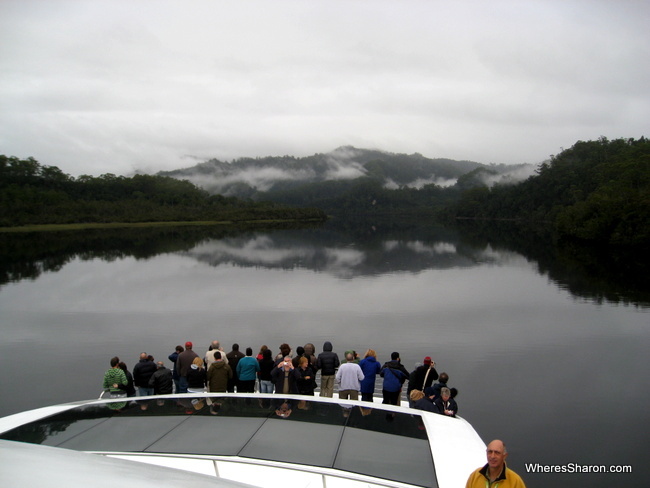 The other must visit attraction on the Tasmanian West Coast is a Gordon River cruise. The scenery in this World Heritage area is just amazing and boat is the only way to access it. The Gordon River cruises will also take you to the mouth of the Macquarie Harbour and to Sarah Island, once a convict prison. 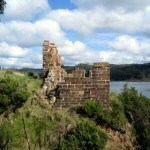 Sarah Island has ruins you can explore and a tour of this was included with our Gordon River cruise. 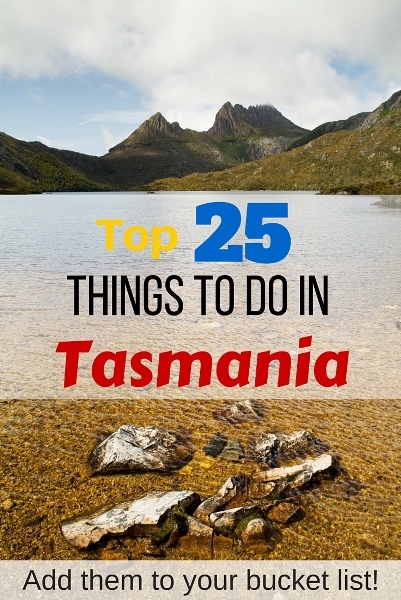 Hopefully you have found this list of the top things to see in Tasmania useful. I know it has filled me with wanderlust just writing it and I am having to hold myself back from booking another trip to Tasmania soon – I want to do it all again! Tasmania truly is a beautiful destination and you can’t go wrong visiting some (or all!) of the places I have on this list. You can find our full guide to visiting Tasmania here. If you are considering taking the Spirit of Tasmania to Tasmania from Melbourne, you may also be interested in our article about our experiences on “the boat”. Sullivans Cove Apartments, Hobart – These apartments are stunning and well located on Hobart’s waterfront. They are great for couples and also make a fabulous choice for family accommodation in Tasmania. Click here for the latest prices – Read our full review. Lufra Hotel and Apartments, Eaglehawk Neck – We had a fabulous stay in these beautiful apartments which are perfectly located for a trip to the Tasman Peninsula and Port Arthur. Click here for the latest prices – Read our full review. Freycinet Lodge, Coles Bay – Best place to stay in Tasmania on the East Coast. This is amazing accommodation by Freycinet National Park. Click here for the latest prices. Aspect Tamar Valley Resort, Grindelwald – An excellent base to discover Launceston and the Tamar Valley while staying in the cool Swiss Village of Grindelwald. Tons of facilities and many room types. Click here for the latest prices – Read our full review. Hotel Grand Chancellor, Launceston – Handy, 4 star accommodation in the centre of Launceston. Click here for the latest prices. Discovery Park – Cradle Mountain – Nice cabins surrounded by bush opposite the Cradle Mountain Visitor Centre. Great for backpackers, families, anyone. Click here for the latest prices. 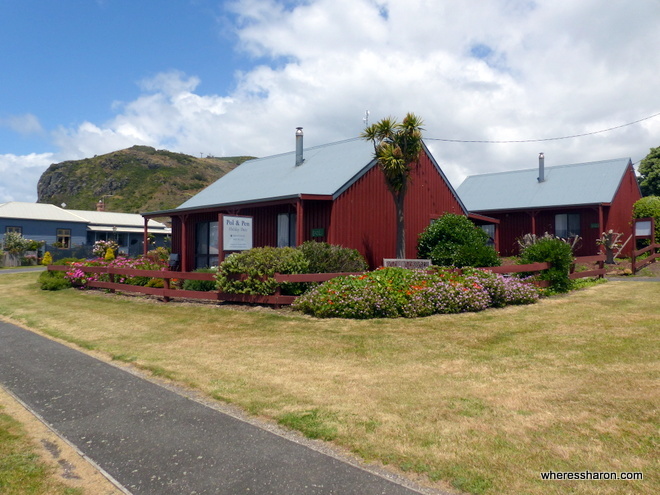 Stanley Hotel and Apartments, Stanley – Great option in this scenic town with beautiful cottages available. Click here for the latest prices. Sunrise Devonport – Convenient option near the Spirit of Tasmania perfect for your first or last night in the state. Click here for the latest prices. 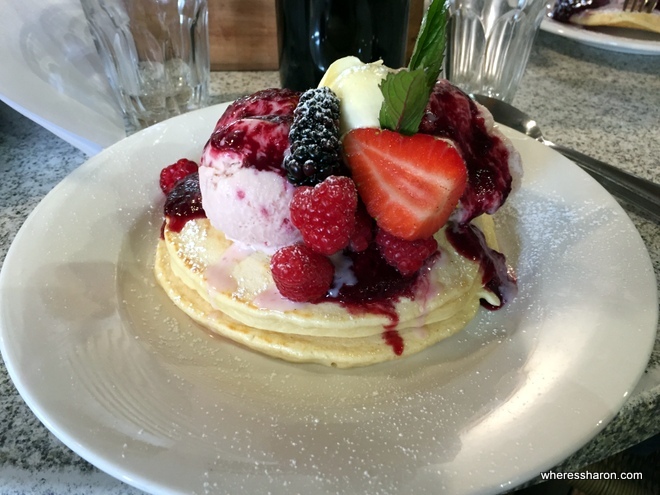 Kitty’s Place, Strahan – Convenient, well priced option in Strahan. Click here for the latest prices. Have you been to Tasmania? What’s on your Tasmanian bucket list? Disclaimer: This article contains affiliate links. This means that if you make a booking after clicking on one of our links that we may receive a small commission at no extra cost to you. Thanks for supporting our site! Nice post Sharon. I haven’t been to Grindelwald or Doo town, which sounds intriguing! I’ve spent a bit of time in the rugged west and would love to explore places like Sarah Island. Stanley sound great too. So many things to do in Tasmania, one of my favourite places in the world. Love the list Sharon….but you have made one error…Tarkine Forest is in the far North West, not North east as you have stated! Bridestowe Lavender is another of my favourites, and New Norfolk for the Antique Shops and beauty of the Derwent River. Great article! I’m a bit with Steve’s comments above, but I won’t try to impose on the ambience of some of Tassie’s best kept secrets. There are many others of course, but half the fun of a trip is doing the planning. Enjoy! Thanks for the suggestions. It made by Tasmania road trip fantastic! I went in winter and unfortunately the Tarkine Forest Slide was closed down (I think for maintenance?) I was gutted as it looks great! Oh no! We are going there in a few weeks. I actually only found out about it when I was brainstorming online to write this article. It’s the only thing I haven’t been to on this list and I am looking forward to it. What an informative post. The only thing I knew of Tasmania was the little devil and that was just from cartoons! We would love to visit one day and we always travel with the kids! LOL! Yes, I can see that…not a crazy wild creature from Melbourne…that I know of anyway!! Wow, some impressive looking places here. I especially like the Bay of Fires; my kind of place. Tasmania is on the bucket list!